In Bagru, a city in Rajistan, India, hand printed textiles have followed the same tradition for over 350 years. Block Shop are trying to help keep this historic method alive by carving wooden blocks and mixing natural dyes by hand, and simultaneously ensuring ethical and environmental standards stay at the heart of their textiles. The team behind the designs are sisters Lily and Hopie Stockman, who respect the process wholeheartedly, honouring the subtle imperfections that come with hand printed fabrics. The sisters struck up a partnership with a cooperative printing workshop several years ago and work with talented block carvers, dye mixers and seamstresses. The result is growing collection of unique scarves, ethically made using natural materials whose sales go to support the talented community: 5% of the proceeds are invested back into local projects. Hopie discussed the ethical objectives behind the brand and the spirit of the ancient textile tradition in this interview with Ecouterre. Could you tell me how Block Shop began? What began as an India-based art project in 2010 quickly evolved into a project of passion the moment our very first prototypes came out of the washing vats. It all started when Lily was living in Jaipur on a painting apprenticeship, where she began experimenting with hand block printing. She found her way to an exceptionally talented hand block printer, and they started collaborating on designs. Hopie visited the same printing community six months later to establish a business partnership. A wild hare business plan was then hatched, and a basic website was built. That was two years ago. Block Shop now employs over 20 printers in the village of Bagru. As co-founders, sisters, and best friends, we share in both the creative and business aspects of Block Shop (with only the occasional sister-spat meltdown in the 120° degree Jaipur heat). Everything we do at Block Shop stems from our love of hand block printing and the people who bring our designs to life, one piece at a time. What are the main objectives of the brand? 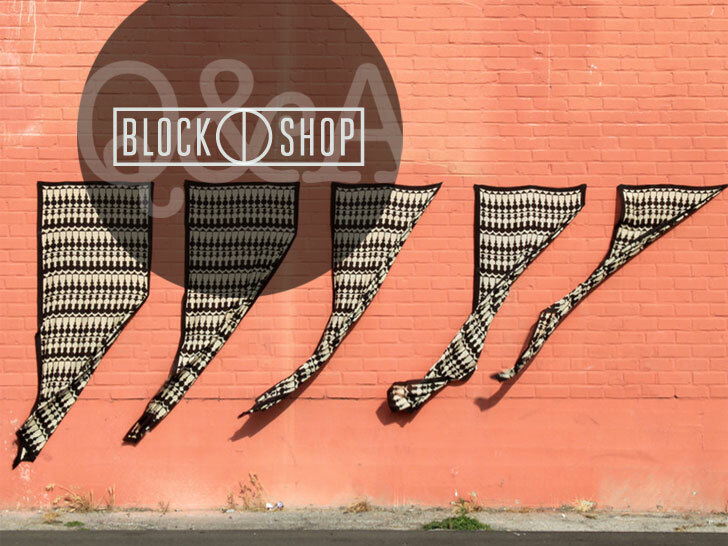 Block Shop’s mission is to make heirloom textiles while upholding the highest ethical and environmental standards in every step of our process. We invest 5% of our profits into a healthcare program for the printing community of Bagru. in 2014 we ran our first mobile healthcare clinic which treated 250 people. This past February we began our 2015 project to install RO and UV water filters and tanks in the homes of our 18 co-op members to cut down widespread water-borne illness in our Bagru community. We are in this for the long haul. How are the textiles produced? We take pride in how low-tech our process is. The hand is involved in each step of design and production. We design using pen and watercolor, which we translate onto graph paper. No Illustrator or Photoshop. So much of our day is spent on screens, we take legitimate joy in the challenge of bringing a textile to life from a simple sketch. We try to push the boundaries of hand block printing by constructing large-scale compositions not usually found in traditional, intricate hand block prints from India. For us, that’s part of the fun of it – combining ancient process with modern design. Our master block carvers carve each element of our drawings onto blocks of sisam wood. 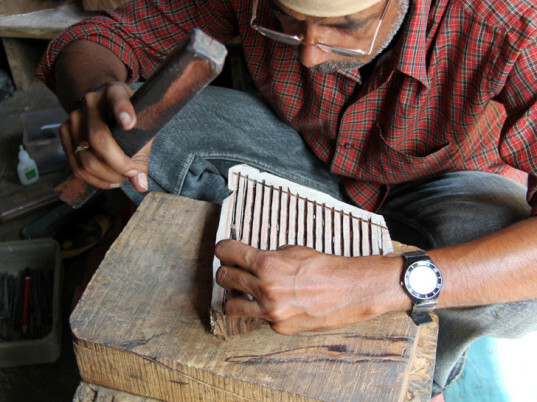 The blocks are then handed off to master printers, who use traditional dyeing, printing, and resist printing with mud paste (dabu) techniques to bring our patterns to life, one piece at a time. Our printers don’t use measuring devices; they eyeball the registration of the block – which requires remarkable skill and an innate design sense. Our strict use of non-toxic dye informs our color palette and ensures an environmentally sustainable process. One scarf takes two to five days and over five people to create. The pieces are really stunning. Where does the inspiration come from for the designs? Thank you! Rajasthani architecture is our first point of departure, and our designs are always rooted in the places we love. 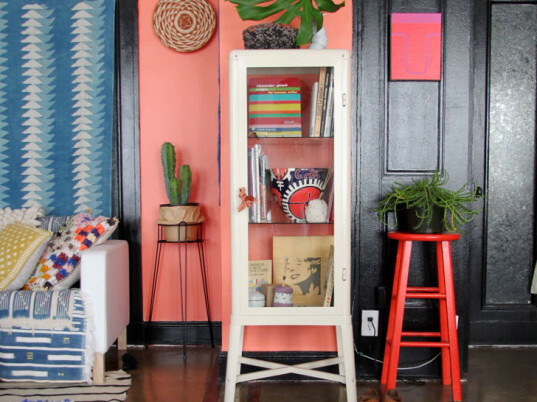 The crumbling, salmon-colored buildings of Jaipur consistently inspire our geometry, while our palette is drawn from the Mojave Desert, which plays to our use of natural dyes. We spend a lot of time designing / escaping the city in Lily’s cabin outside of Joshua Tree, CA, so desert colors are always creeping into our patterns. The brand has evolved a lot since its inception. Where is it likely to go next? We are just beginning to wholesale, which has been thrilling, and are excited to launch our collaboration with LA-based Poketo this spring (which will include a hand block printing workshop in Joshua Tree). That said, online is our bread and butter. We love our customers dearly and customer interactions are what get us out of bed in the morning – be they in person studio visits, or instagram exchanges. Our product line is expanding into home textiles this spring with hand block printed pillows and hand-stitched kantha quilts. As we grow, we will always keep our collections focused and consistent.